Nothing says I love you like a chocolate pretzel crusted, berry laden Nutella Berry Pie with Pretzel Crust. You know you want to eat the whole thing. Admit it. Earlier this month was my husband’s birthday. We kept the celebration small and informal, the way he likes it. We save the big, fun parties for the kids’ birthdays. His favorite dessert is tiramisu. I’ve made it several times for him. Haven’t posted the recipe yet. But, it’s his favorite. I didn’t make it this year. Cruel wife? No, not really. I had my reasons. As many of you know, last month a fellow-foodie, Jennie from In Jennie’s Kitchen, lost her husband suddenly from a heart attack. And now she is struggling to live without her partner, her best friend and to begin a new chapter in her life and raise her girls alone. Her story has moved many of us. The beautiful video by WORC will reduce you to tears. Jennie asked the food bloggers to make her husband’s favorite pie, in Mikey’s honor. A Creamy Peanut Butter Pie. When I found out about it, I didn’t have much time to get the ingredients. Life was busy with school starting. Errands. Appointments. I told myself I would do it, eventually. When my husband’s birthday rolled around, I remembered Jennie, and I made up a pie for my husband, but with Mikey on my mind. It’s not peanut butter, it’s Nutella – our family’s current obsession. The crust is made with pretzels and chocolate. 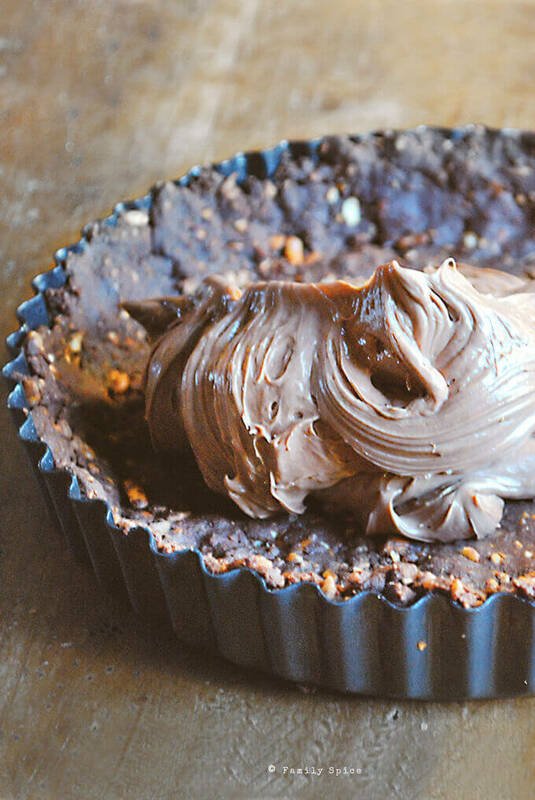 The filling has cream cheese and Nutella. The topping fresh berries & melted jam. 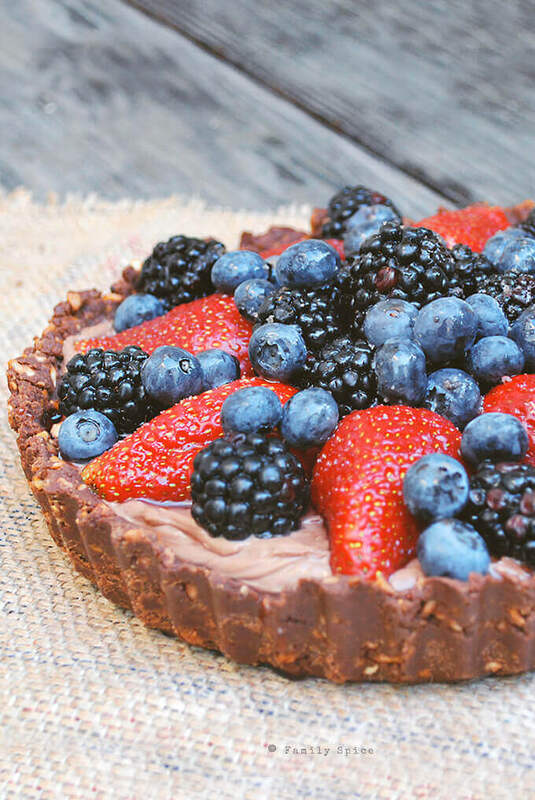 This Nutella berry pie is ridiculously delicious. 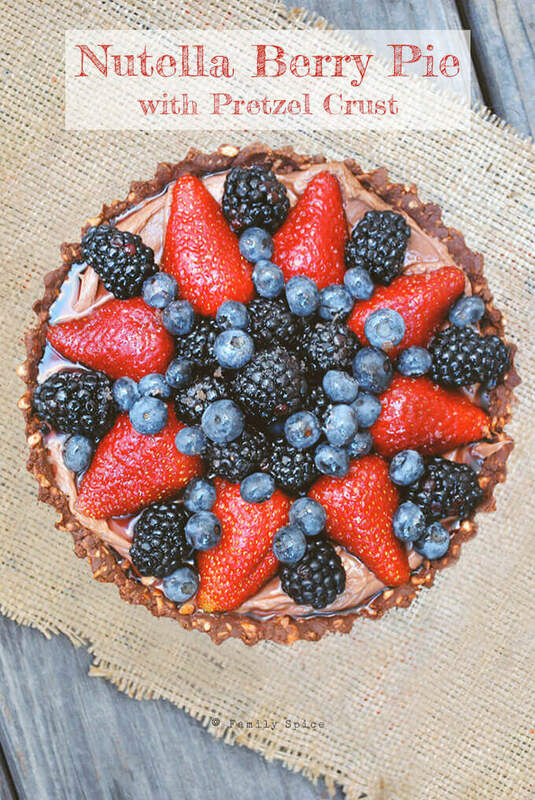 I love the sweet and salty combination for the crust, the creamy, dreamy Nutella cheese filling and the sweet and juicy berries on top. A simple pie to show the one’s you love, well, that you love them. Because we don’t know how long this roller coaster called life will last, so we better enjoy the ride while we are on it. 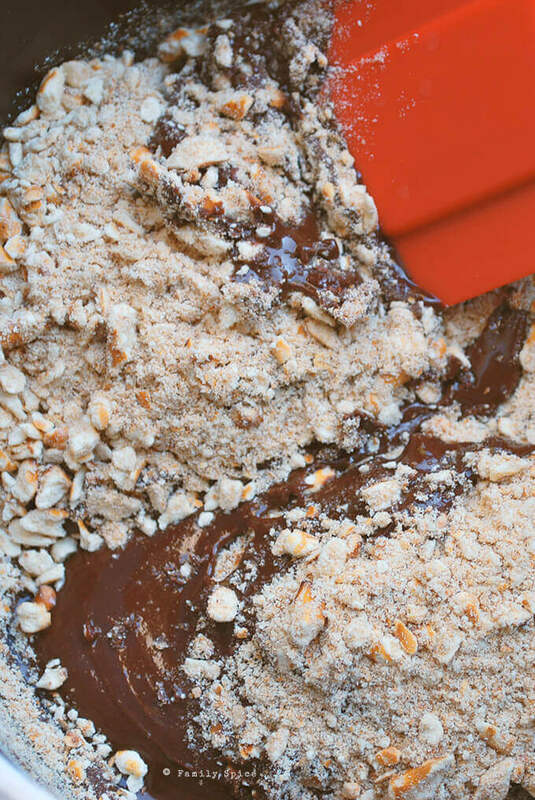 Remove chocolate mixture from heat and stir in the pretzel crumbs. Coat an 8-inch tart pan with removable bottom with non-stick spray. Press chocolate-pretzel mixture into the bottom of the prepared pan, pressing it up the sides into an even layer. Spread the Nutella mixture evenly into the chocolate-pretzel crust. Place tart back in the refrigerator and chill for at least an hour. Prior to serving, remove tart from pan, slice and serve. It's a beautiful tart and I am sure Jennie would appreciate it. What a great looking tart. Perfect way to remember and celebrate your husbands birthday. What a thoughtful dessert for your husband's birthday. It sounds delicious, too. The crust of this pie looks SO GOOD!!!! I am sure your husband loved it! What a poignant and meaningful way to celebrate your husband's birthday. I can see the love that went into creating this amazing pie for him. Thank you for sharing the moment with us. Well written post and happy birthday to your husband. This recipe is a real keeper-love the delicious flavors in it-lucky husband! What a beautiful dessert – I'm sure it was a great hit. I love the arrangement of berries, it's a lovely presentation! Thank you so much I put my information in a email. what a nice way to honor "A pie for Mikey" while celebrating your hubby's bday! how sweet! Thank you for sharing this recipe. I had decided against making the peanut butter pie because my daughter can't have peanuts, but she CAN have nutella. YEAH! Thanks. 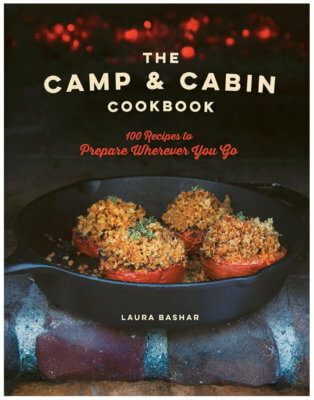 Oh Laura every time I look at your recipe, photos and post I can't stop drooling. Definately going to make this for the two of us. Thanks for participating in September's YBR 🙂 Sorry I'm so late in getting here. Can you make this with another type of pan? Like a simple round pan? Hi Gabriella! Yes, you CAN make it in a simple round pan. You just have to serve it out of the pan, like you do a pan. 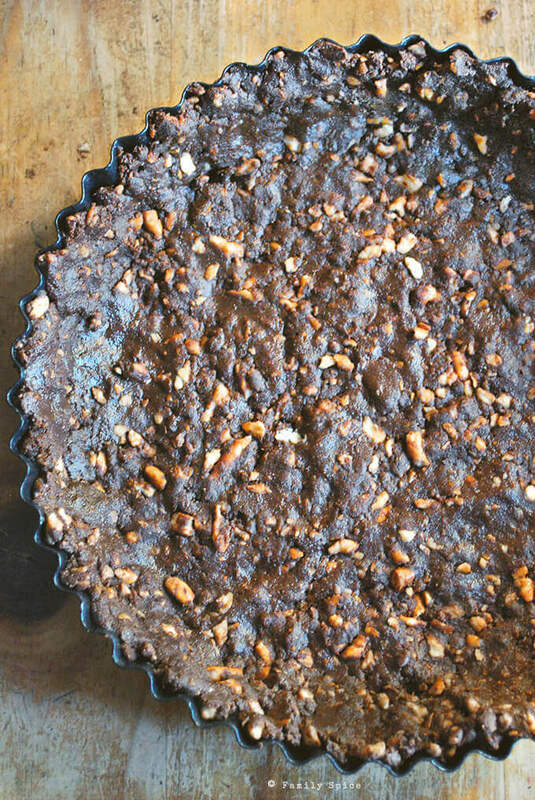 The tart pan makes it easier to remove the entire pie.